Audience: Although this is written for adults, I think this book could be used effectively with high school age adolescents through young adults. 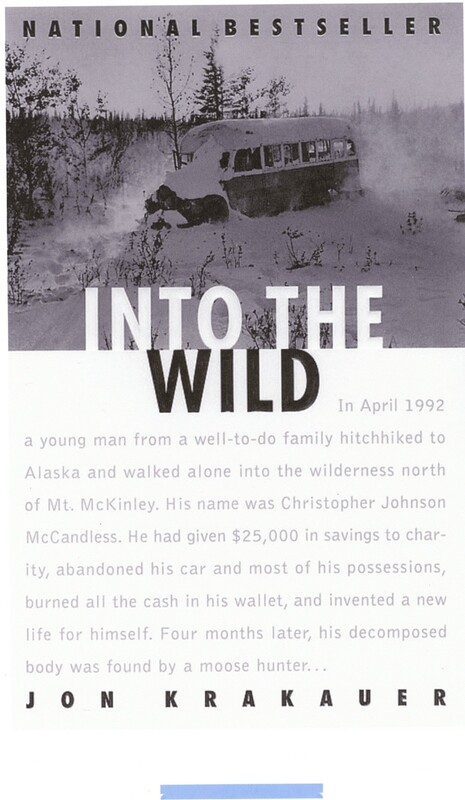 Summary: In 1992 Christopher McCandless graduated from Emory University, gave his $25,000 savings account to charity, burned all his money and identification, gave away the vast majority of his possessions, and eventually abandoned his car. Why? To begin an almost 2 year journey, hitchhiking around America, to “find himself”. Eventually he arrives at his destination, the wilderness of Alaska, where he finds an abandoned transit bus turned hunting “lodge”. McCandless lives here until he eventually dies of starvation, due to accidentally poisoning himself with berries. The book is written using Christopher’s diaries, letters, and notes found with the body, as well as from interviews with family members and friends McCandless made during his trek to self-discovery. Literary elements at work in the story: The book takes place during 1990-1992, and follows the two year ordeal of the main character, Christopher McCandless. This book could be categorized in several different ways. First, I think it can be called a partial biography since it deals mainly with the two year time period that Christopher spent wandering and hitchhiking trying to make it to the Alaska wilderness. There are occasional flashbacks to McCandless’ childhood and adolescence, but these are merely to flesh out a point or explain part of his rationale for this trek. Second, in my opinion, this book could be considered an autobiography or memoir of the main character Christopher McCandless since it is written mainly from his own diaries, letters and notes. Finally, it is also, in a sense, a memoir of the author, Jon Krakauer. Throughout the book he draws parallels between his life – his own rebelliousness, his own struggles with his parents, his loss of faith in mankind, God and society, and his extreme efforts to find his “place” – and the life of Christopher McCandless. The point of view alternates between the author and McCandless which makes the story a little less fluid, and occasionally a little difficult to follow. The other characters in the book seem to help McCandless “find” a part of himself that he is looking for. The book is written in a very realistic and gritty style that allows you to feel the physical hardships and highpoints he endures. It is a beautifully written book that at the same time allows to you feel Christopher’s desperate desire to know who he is and to achieve his goal, and his elation and peace when he finally achieves his goal and “finds what he is looking for”. (How) does the perspective on gender/race/culture/economics/ability make a difference to the story? Economics seem to play a role in the events that unfold in the book. Christopher is disenchanted with the life his parents lead and expect him to lead, a life of privilege and overconsumption. Part of his quest for self is a quest for a simpler more authentic way of life. However, McCandless takes his quest for economic justice and a simpler life to an extreme. Theological conversation partners: As Christians we believe that we are in a constant relationship with God. We believe that God is present and active in our life at all times. We also believe that it is in that relationship with God that truly discover who we are and grow into the person God intends for us to be. We also believe that we are called into action to strive for social justice and equality for all. McCandless states that he’s not sure that God exists but there is something more out there. Instead of looking for answers within the context of God as that higher power he runs away from God. Also, in his attempt to find social justice for the poor and disenfranchised he runs away from society instead of working to find a way to bring about change. Why do you think people turn away from God? How can faith and a relationship with God help someone to “find themselves”? What does it mean to work for social justice? How can we do this in this day and age? How does our faith help us to work for social justice? Into the Wild by Storypath is licensed under a Creative Commons Attribution-NonCommercial 4.0 International License. I have this book in my “to read” pile, maybe I’ll have to pick it up sooner rather than later, sounds interesting!